Opti-V™ authentically recreates the sensory experience of sitting in front of a wood fire. Dimplex Opti-V™ dazzled audiences and took home the 2014 Vesta Award for the Electric Products category at this years’ HPBExpo in Salt Lake City. Winners of the prestigious award are chosen by a panel of judges selected from the ranks of retailers, distributors, designers, laboratory scientists, affiliate leaders, and other industry leaders. The unique patented design combines flickering flames with three-dimensional LED logs that sporadically spark and crackle. With the perfect blend of magic and realism, Opti-V™ has created the most unbelievable flame effect yet, resulting in award-winning fireplace technology. Opti-V™ is the first electric fireplace to authentically recreate the sensory experience of sitting in front of a wood fire. Using a unique and patented combination of real fire footage displayed on a high-definition LCD screen with a clever illusory technique, Opti-V™ renders scenes of flickering flames which dance amidst a refractory brick effect, between carefully molded logs, providing a true three-dimensional depth-of-field. With the addition of an audio element of crackling logs, the illusion of experiencing a true wood fire is startlingly real. The proprietary illusion that Opti-V™ uses to create its convincing effect is called Pepper’s Ghost; a reference to John Henry Pepper, the university professor that invented the technique in the mid-1800’s. Pepper’s Ghost famously makes ghosts come to life at Disney’s Haunted Mansion attractions. Dimplex uses Pepper’s Ghost to give the amazing depth and dimension to the Opti-V™ flame effect. It requires the use of two full sets of Dimplex’s patented LED inner-glow logs, one visible and one hidden, which reflects off a precision glass panel. This creates the illusion of a three-dimensional firebox with flames that appear as they would in a natural wood fire. Combined with the use of real, high-definition wood flame footage that includes sparks and sound, there has never been a more realistic electric fireplace. Designed for the built-in recessed look, Opti-V™ technology is available in two inspiring sizes to suit any installation: Opti-V™ Solo is 30 inches wide x 17 ¾ inches high and Opti-V™ Duet is 54 ¼ inches wide x 17 ¾ inches high. Opti-V™ allows for a completely customizable wall treatment with zero-clearance for a seamless look that suits the most beautiful designs. It can be hardwired and there are no gas lines or venting to consider. It is completely maintenance-free and operates with 100% efficiency at less than one cent per day. 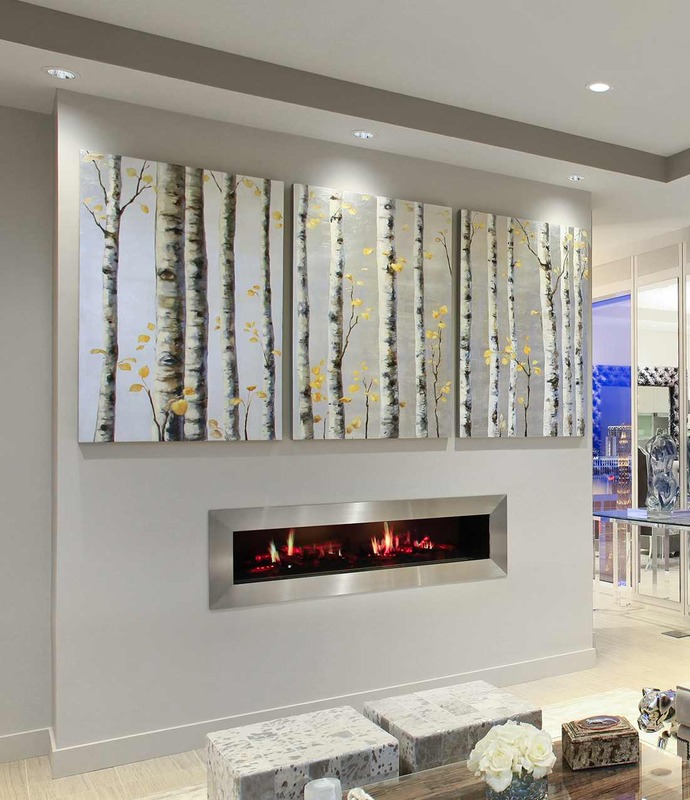 Opti-V™ is a fireplace like no other. The flames flicker and dance like gas, but it’s not gas. It crackles and sparks like wood, but it’s not wood. It’s virtually magic!